Belfast’s Shankill Road will be illuminated by lanterns and a unicorn float and on Friday, November 30 as Beat Carnival host the Light Up The Road parade with support from Belfast Harbour. The Shankill Lantern parade will be running for the third year in a row with over 1,000 local participants lighting their lanterns as part of the Greater Shankill Winter Festival. The parade is part of a programme of activities organised by the Beat Carnival, including workshops where community participants will design and construct a main visual centrepiece to the parade. Lola Devlin and Lola Bowen, David Boyd, director at Beat Carnival and Matt Vernon, carnival artist at Beat Carnival. This year’s theme is 'The Magical Unicorn' and community participants will create a float in the shape of a large unicorn feature. The workshops will be guided by Beat’s specialist construction artists. The feature will be displayed at the event finale location where UTV's Frank Mitchell will switch on the Christmas Lights and performances will take place. David Boyd, Director at Beat Carnival, said: “Support from Belfast Harbour is critical in bringing our programme to life. The Lantern Parade is a highlight of the Greater Shankill Winter Festival and we hope it is a manifestation of the hard work the community have put into the workshops. 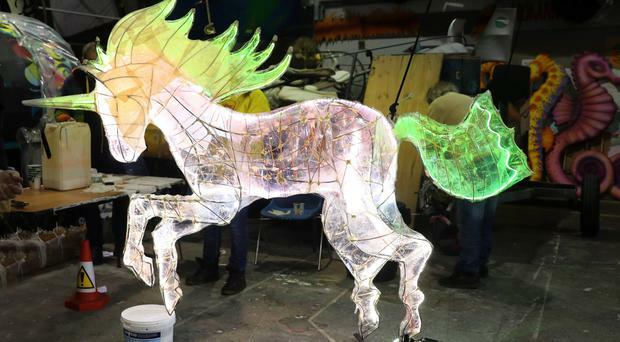 “It’s not just about celebrating culture but encouraging the local participants to endeavour to create, the ‘magical unicorn’ float is a visible demonstration of the participants’ own creative achievement."